On July 13, Economics issued a report predicting a 10.2% decrease in the housing market over the next two years. The economists specifically focused on Vancouver and Toronto saying that they will experience an even larger decrease ...with a whopping drop of 14.8 % for Vancouver. Among the twelve major markets profiled in this report, Vancouver and Toronto look poised for larger-than-average declines over the next few years, reflecting in part their exposure to the condominium segment, which appears particularly ripe for a correction. A combination of more subdued job and household income growth, rising interest rates, the recent tightening in borrowing rules for insured mortgages and fewer first time home buyers are expected to be the chief culprits behind the slowdown. With most of these drivers expected to remain supportive to housing demand in the very near term, we anticipate that the brunt of this adjustment will take place in 2012 and into 2013. With Vancouver consistently making all the Top 10 best city lists, it is little wonder that our housing prices are amongst the highest in Canada. The predictions focus on the higher than average housing prices, condos and foreign investment factors that have driven the prices up. Vancouver has been the poster child for those individuals worried about a real estate bubble here in Canada. We expect that Vancouver will post modest economic growth accompanied by subdued job and income gains. Interest rate hikes will be felt in Vancouver likely more than other places due to the fact that household debt levels are the highest across the country. With this economic climate, we foresee a 25.4% peak to- trough decline in sales and 14.8% in prices over 2012-13, by far the worst fate of any urban centre. Still, the path to correction will likely transpire over seven to eight quarters. What's more, just as some of the recent increase has reflected a shift in the composition in sales towards higher priced homes, normalization in the sales mix going forward will disproportionately weigh on average prices. At the expected through in 2013, the average resale price is expected to sit at $675,000 - nearly double the national number and that of most other urban centres. I hope you find this information beneficial! Please feel free to call me any time. VANCOUVER, B.C. – July 5, 2011 - Home sellers outpaced buyers on Greater Vancouver’s Multiple Listings Service® (MLS®) in June, drawing the market back toward balance this summer. The Real Estate Board of Greater Vancouver (REBGV) reports that residential property sales of detached, attached and apartment properties reached 3,262 in June, a 9.8 per cent increase compared to the 2,972 sales in June 2010 and a 3.4 per cent decline compared to the 3,377 sales in May 2011. Last month’s new listing total was 9.8 per cent higher than the 10-year average for June, while residential sales were 7.3 per cent below the ten-year average for sales in June. “With sales below the 10-year average and home listings above what’s typical for the month, activity in June brought closer alignment between supply and demand in our marketplace,” Rosario Setticasi, REBGV president said. “With a sales-to-active-listings ratio of nearly 22 per cent, it looks like we’re in the upper end of a balanced market.” At 15,106, the total number of residential property listings on the MLS® increased 3.1 per cent in June compared to last month and declined 14 per cent from this time last year. The MLSLink® Housing Price Index (HPI) benchmark price for all residential properties in Greater Vancouver over the last 12 months has increased 8.7 per cent to $630,921 in June 2011 from $580,237 in June 2010. “The largest price increases continue to be in the detached home market on the westside of Vancouver and in West Vancouver,” Setticasi said. Since the end of May, the benchmark price of a detached home rose more than $147,000 on the westside of Vancouver and over $80,000 in West Vancouver. Detached home prices in Richmond, however, levelled off slightly, declining $25,000 in June.” Sales of detached properties on the MLS® in June 2011 reached 1,471, an increase of 29.1 per cent from the 1,139 detached sales recorded in June 2010, and an 11.8 per cent decrease from the 1,667 units sold in June 2009. The benchmark price for detached properties increased 13.4 per cent from June 2010 to $901,680. Recovery on the economic front will go hand in hand with retail and office investment in 2011, as developers cautiously brush off plans for towers downtown and improved housing starts boost demand in the suburbs for retail projects. But this year will be characterized by hard bargaining on prices and incentives as doubts remain about the depth and speed of the economic recovery. While Metro Vancouver retail remains "the most sought-after property type" in Canada, according to a third-quarter report by Avison Young, sales tallies are off across the board from the second quarter as activity slowed in the second half of 2010 to the lowest level since the first quarter of 2009. Overall investment sales totalled $527.3 million in the third quarter of 2010, including $68.8 million worth of office deals and $143.7 million worth of retail sales. Those deals include South Surrey's South Point Exchange, which sold to a private investor for $91 million, and Bosa Development Corp.'s sale of Semiahmoo Shopping Centre to First Capital Realty Inc. for $82.7 million - both driven by strong growth in surrounding residential communities. But the deals also highlight the shift from the bargain-taking deal-making that characterized the first half of the year to a strategic rejigging of portfolios in the second half that heralds more stable conditions as owners prepare for the long term. Based on interviews in the third quarter, Colliers International reported that 61 per cent of investors were looking to expand their portfolios, down slightly from six months earlier when 65 per cent were looking to expand. On the other hand, approximately 22 per cent were looking to rebalance. Close to two-fifths of respondents attributed the shift in emphasis to a desire to shift asset classes, while other key factors were linked to advantages to be gained from location, liquidity and leverage. Approximately 17 per cent were looking to trade up or trade down and 6 per cent were looking to increase leverage. A further 28 per cent refused to disclose the reasons for rebalancing their portfolios, but the several factors point to a hunkering down for the long term in the face of lacklustre growth for the year ahead. Readers Choice Award - Westender 2011! 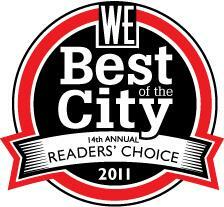 The results have come in for the Westender 2011 Best of the City readership poll and we have been awarded in the category for "Best Realtor in the City"! A sincere Thank You to all who voted! Your support means everything!